KINGMAN, Ariz. — The Arizona Game and Fish Department (AZGFD) will participate in a multi-agency enforcement patrol this weekend on the Colorado River, pursuing those who are operating their boats and other watercraft while under the influence (OUI) of drugs or alcohol. AZGFD, together with the Mohave County Sheriff’s Office and the U.S. 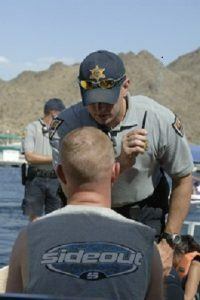 Fish and Wildlife Service, will be enforcing Arizona’s OUI legal limit of a .08 blood-alcohol content. Throughout the weekend, boaters may be required to pass through a checkpoint and be subject to a systematic safety inspection. Operators will be checked for any sign of impairment from alcohol or drugs, and to ensure the required safety equipment, such as proper life jackets and working fire extinguishers, are aboard. Carley advises boaters and watercraft users should review all regulations prior to launching. That includes having a U.S. Coast Guard-approved life jacket for every person on board and making sure that anyone 12 and under is wearing one at all times. Boats also must be equipped with a fire extinguisher and a Type IV throwable personal flotation device (PFD). Additional multi-agency OUI checkpoints will occur on the Colorado River and its reservoirs throughout the boating season. For more information on boating in Arizona, or to sign up for a free safety course, visit www.azgfd.gov/boating.